It’s a simple fact: Clutter is postponed decisions. 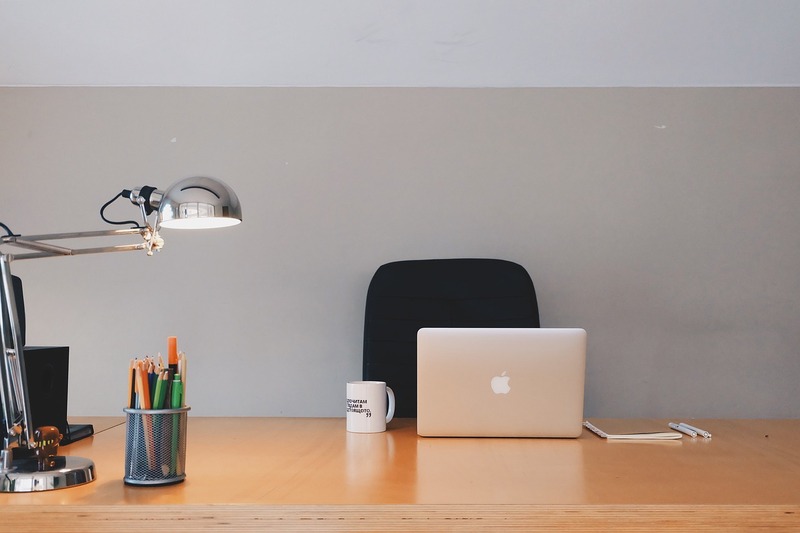 Many entrepreneurs and managers have cluttered offices—unless they have an organized assistant. If you don’t believe it, just start looking around you. Begin in your own organization, and then look in places like the manager’s office of your local retail store. What is the Problem? Getting and staying organized is not easy—if it were, there wouldn’t be so many highly successful, intelligent, creative people who struggle with it. 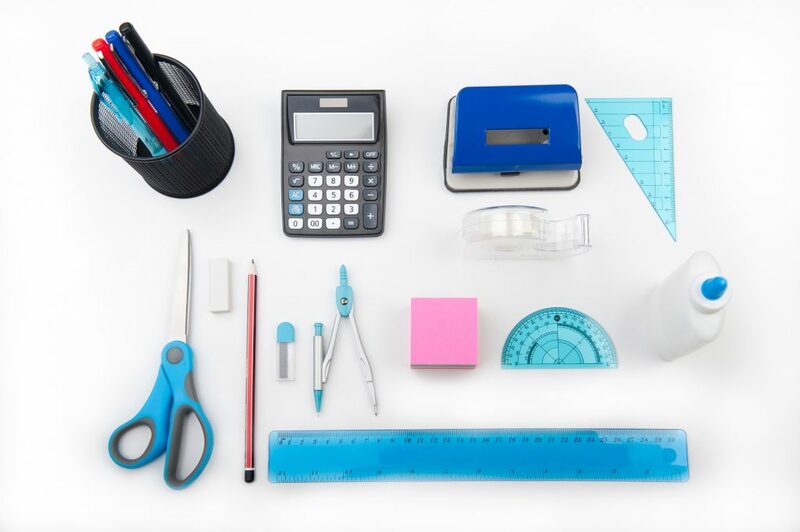 Unfortunately, organization skills are not taught in school, so unless you were born organized or had a good role model for organization when you were growing up or in a job situation, you’re out of luck. The combination of computers, and a desire to reduce overhead expenses, means fewer administrative assistants, and as a result, messier offices. Solving the Problem: There are numerous ways an office can be organized, but statistically, most offices simply have too much stuff. Look at each item in your office and ask the question, “Does this help me accomplish my work or enjoy my life?” If the answer is “No,” but you’re still reluctant to get rid of something, ask “What’s the worst possible thing that would happen if I didn’t have this?” If you can live with your answer, “donate, recycle, or toss it”—and work happily ever after. 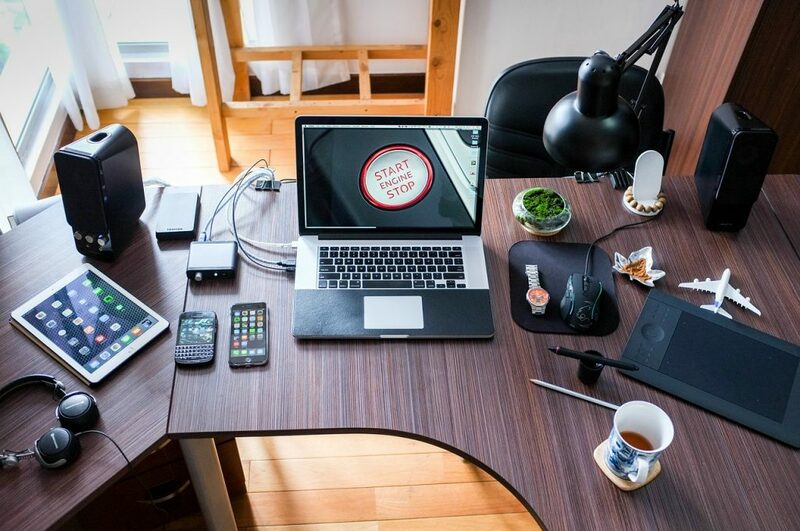 If organizing doesn’t come naturally to you, it’s unlikely that with even the best system you will have a continuously neat desk, but cleaning it off at the end of the day, or at the very least, the end of the week, will be a cinch if you simply have a SYSTEM (Saving You Space Time Energy Money). In/Out/File: Place three containers on your desk within reach of your chair. One for the items you have not yet looked at. One for items you need to take somewhere else—another person’s office, the post office, etc. One for items you need to file in a location within your own office that you can’t reach from your chair. 2. Wastebasket/Recycle/Shred: Make it easy to get rid of what you don’t need. For example, if you have a shredder, but you can’t reach it from your chair, use a desk drawer, or a small box under your desk. 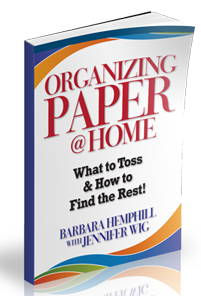 Then develop a system for actually getting the paper shredded—whether you do it yourself or hire your child to do it! 3. Calendar: One of the biggest contributors to a messy desk is papers that serve as reminders to do something. Keeping an open calendar on your desk for making direct entries can help eliminate this issue. While most of us are great at making appointments with other people, we’re not so good at making appointments with ourselves. We need to care for ourselves in order to meet the needs of others. 4. 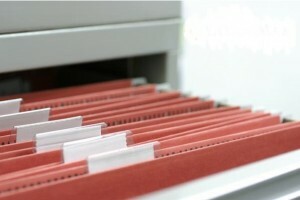 Contact Management System: Another big source of office clutter is papers (and electronic files!) with contact information—names, addresses, phone numbers, e-mails, etc. Most people have a combination of the three. For example, the August 15 file might remind you to write a new ezine, while the project file labeled “Ezine Ideas” would contain the information you need to actually write it. 6. 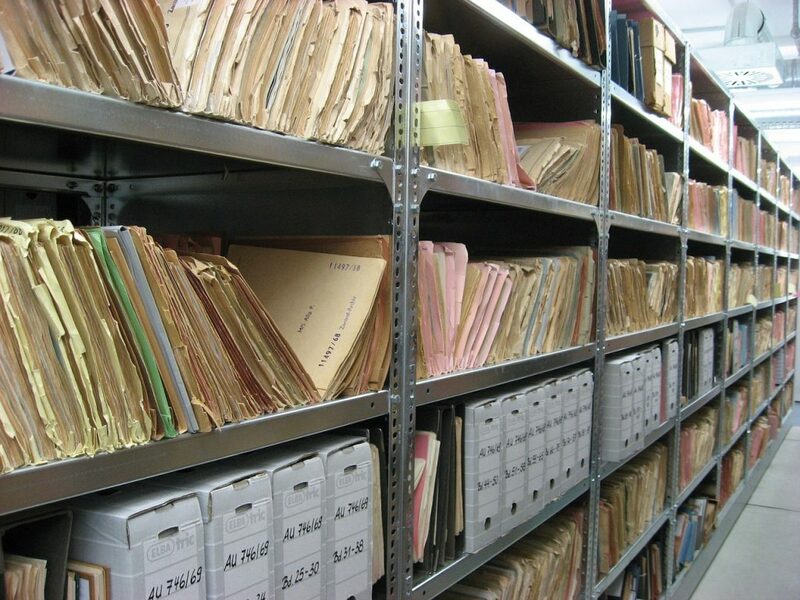 Reference Files: These files contain all the papers you may not need on a daily basis, but don’t want to throw away. They can be located in or outside your office. Your “To File” box will serve as a place to hold the papers that need to be filed. Some projects may have both an Action File and a Reference File. The Action File will contain the papers you are currently using on a project, while the Reference File will contain the completed papers that you want to retain for historical or legal purposes. So here’s your challenge: Set aside four hours. Clear your desk by putting everything on it in a box. Set up The Magic 6 to stop future clutter, and provide a system for every new piece of paper in your office. If you know yourself well enough to know you won’t maintain it, and you want your office to reflect the quality of the products and services you provide, hire someone to help a few hours a week. Your office will look better, you will feel better, and your leadership will shine! Productivity is an art! I’ll never forget the first time I helped a client set up a stand-up desk! Another client had an office full of sticky notes with reminders. When I asked her what kind of calendar she used, she replied, “Oh, I hate calendars. 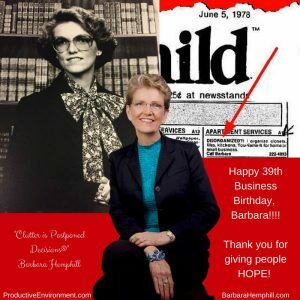 They are so ugly!” A red leather calendar became one of her most beloved tools. Sadly, I see many people whose office or home environment is obviously not supporting them, but they’ve abandoned the idea that they can do anything about it. Perhaps they tried changing it themselves, and failed, or even hired an organizing consultant. It looked great for a few months, but they couldn’t maintain it. 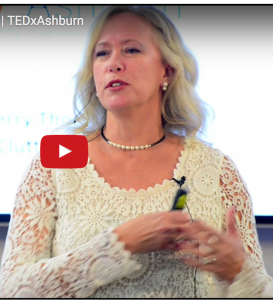 Organizing anything is not about the “stuff,” – it’s about the person or people! More importantly, it is about stewardship of our resources. If we have something we are not using that could benefit others, it is our Christian responsibility to make our clutter someone else’s blessing. If we think something about ourselves or others that is not supported by Biblical truths, it is time to ask for God’s help to eliminate that emotional and spiritual clutter. Notice the common word in those five steps is “your!” One of the reasons that I still love my work so much after more than 35 years is that God created every person and every business to be totally unique — so every day is a new opportunity with new challenges. Interestingly enough, one of the major contributors to customizing an individual workspace is art — whether it’s a calendar that fits our style, music that puts our brain in the state we need to be most productive, a painting that inspires us, or a “dream board” that reminds us of why we work. Make your home and office a place that inspires your best for the sake of the Kingdom! So here’s my challenge: Ask yourself the question: “What is the most important step I need to take in the next year to make my business and my life all that I believe God intended it to be?” Then apply the 5-Step process to making that vision a reality! Everything you feel or think about that issue is one of the five steps. If you’re not sure, don’t be afraid to ask us for help! ALL paper throughout the house has been rounded up and processed. I took two lawn & leaf bags of shredding to Staples on Saturday. I eliminated the need for 1 four-drawer filing cabinet. Now, everything fits in one small filing cabinet that holds our printer. The day bed in our office is now entirely clear and is once again a perfect reading spot. Our dining room table and kitchen peninsula are now free from piles of paper. The SwiftFile is in use. The File Index is great! It helped me so much to organize files in my head. At first, I worked with a draft. As I started processing the papers, it became obvious that I needed to modify the index. Having it on the computer made the process so simple. I was able to print labels for the folders once. In the few days since I completed the project, I am already reaping the rewards. Last evening after dinner, I went back to the office to read a book with my little dog. The best part was that I had no guilt about the chaos surrounding me. Do I have things to do around the house? Yes, of course. But I know when I’m going to work on them.